George Washington University (GW) researcher Narine Sarvazyan, Ph.D., has invented a new organ to help return blood flow from veins lacking functional valves. A rhythmically contracting cuff made of cardiac muscle cells surrounds the vein acting as a ‘mini heart’ to aid blood flow through venous segments. The cuff can be made of a patient’s own adult stem cells, eliminating the chance of implant rejection. Creating “mini hearts” may help to solve chronic venous insufficiency, one of the most pervasive diseases, particularly in developed countries. Its incidence can reach 20 to 30 percent in people over 50 years of age. It is also responsible for about 2 percent of health care costs in the United States. Additionally, sluggish venous blood flow is an issue for those with diseases such as diabetes, and for those with paralysis or recovering from surgery. This potential new treatment option represents a leap for the tissue engineering field, advancing from organ repair to organ creation. 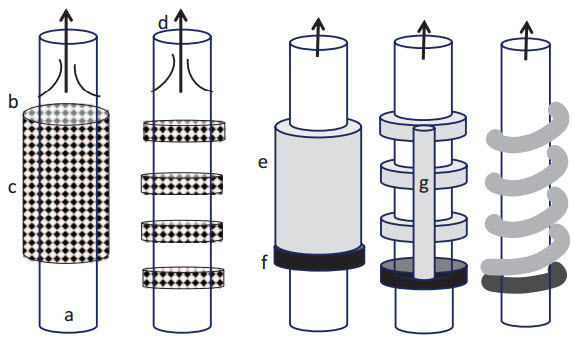 Sarvazyan, together with members of her team, has demonstrated the feasibility of this novel approach in vitro and is currently working toward testing these devices in vivo. “Chronic venous disease is one of the most widespread diseases in the Western world, Sarvazyan told KurzweilAI. ” In the United States alone, the annual cost associated with chronic venous disease treatment is approaching US$3 billion, constituting over 2% of the total health care budget cost. “For superficial veins, nonsurgical treatment options include leg elevation, compression stockings, and venoactive medications. Surgical options include vein stripping or vein sealing, with the latter using radiofrequency or laser energy or ultrasound-guided foam sclerotherapy. These options seal the vein and, thus, force blood flow through alternative routes. However, for the so-called ‘deep’ venous system, sealing the vein is not a good option, since it can limit routes for flow of blood to return to the heart. Treatment options for patients with chronic deep venous insufficiency remain very limited and this often leads to limb amputation and even death. “The ‘mini heart,’ or what we call the CardioVein approach, offers a bold new solution to this problem. It relies on most recent advances in tissue engineering and stem biology fields. It proposes using the patient’s own stem cells from fat or other tissues to create cardiac muscle cells. These cells are then used in the lab to create small pieces of self-contracting strips of cardiac muscle tissue. The latter are then implanted around poorly functioning veins in the patient. This article considers the use of autologous stem cell-derived cardiomyocytes as a novel means to aid venous return. The approach consists of creating external cuffs of engineered heart tissue around vein segments with incompetent or poorly competent valves. The engineered heart tissue cuff prevents distention of the impaired vein segments and aids unidirectional flow by its rhythmic contractions. There appear to be no fundamental limitations to this approach as feasibility of all of the individual components has already been shown. Here, we underline the clinical need for novel ways to treat chronic deep venous insufficiency, review previous research that enabled this approach, consider potential designs of engineered heart tissue cuffs, and outline its advantages and future challenges.